Accessory Product:Use with the Infinity Home System. Easy to Install:Simply plug the unit into any electrical outlet. Sanctuary II Technology:Contains our most powerful protection technology to date. Layered Protection:Works with all EarthCalm products for added protection. 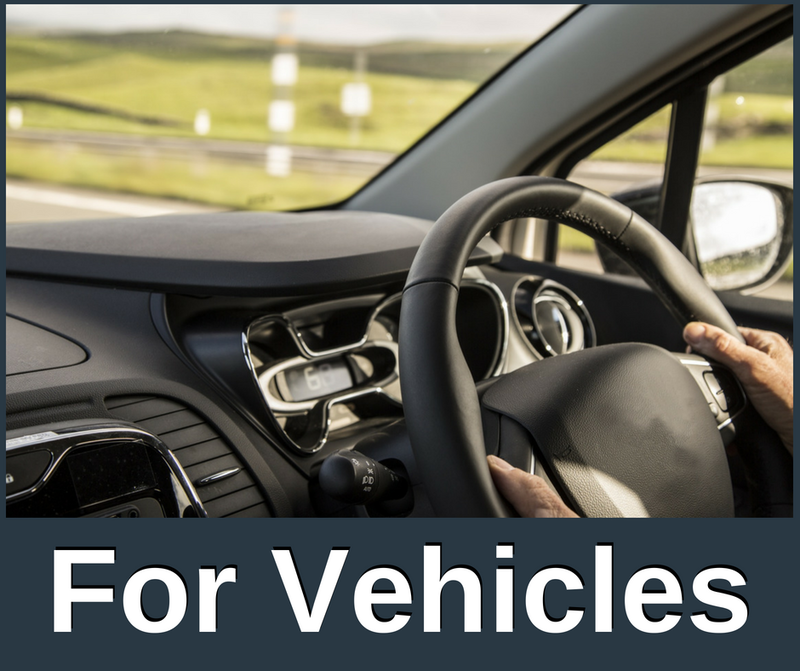 For Use in Vehicles:Use an electrical converter for protection while driving. Great For Travel:Perfect unit to take anywhere you go. 90-Day Money Back Guarantee:Take time to test out the technology. 1-Year Warranty:Limited repair/replacement warranty on all new products. 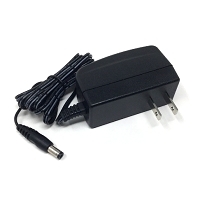 Max 120v:Voltage converter required on electrical outlets over 120v. 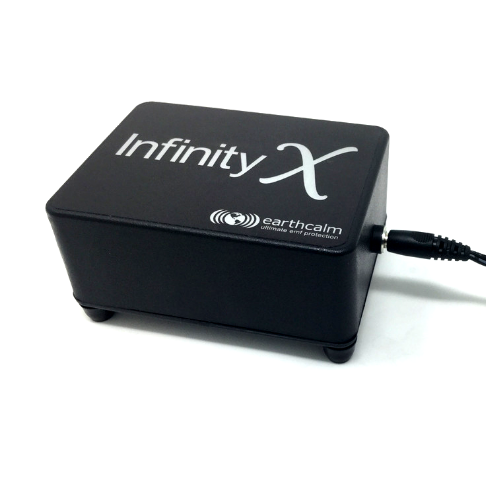 Infinity X is our latest addition to the EarthCalm EMF protection product line. It is designed to be used in conjunction with the Infinity Home System. We highly recommend that you make it all the way through the 4 phases of the Infinity Home System before adding Infinity X.
Infinity X contains an even more powerful version of EarthCalm’s Sanctuary Technology. It works together with your home's electrical system to add Sanctuary to the entire room where it's plugged in. Is there an adaptation period with Infinity X? Anytime you add a layer of EarthCalm technology to your environment, there may be an adaptation period in which case you may need to ease your way into the full strength of the stronger technology. If you find yourself experiencing "detox symptoms", and if this becomes too much for you, simply unplug it for a few hours and then plug it back in again; repeat this process until you're completely comfortable with Infinity X. Some people adapt to it right away. Some need a while longer, especially electrosensitive people, and that's okay! It's important to take your time with it, allowing your body enough time to adapt to the technology. Remember, it comes with a 90-day guarantee, so you should have plenty of time to find out how it can work for you! Yes! One of the best things about Infinity X is that it's portable. Take it with you to the office, or plug it in near the bed in your hotel room for a well-rested vacation. If you have a good quality inverter, you can even plug it into your vehicle. When used on its own, Infinity X won't be as strong as when it's combined with the Home System, but it's a good temporary option for when you're on the go. OUTSIDE THE US: If the country's PEAK ELECTRICAL VOLTAGE is greater than 120v, you must use a good quality voltage converter. Failure to do so could result in damage to the product. The Infinity Home System works for your entire house. Infinity X works in synergy with the Infinity Home System to add our strongest version of Sanctuary technology to the room where it's plugged in. The combination of the two products creates our strongest level of protection. Remember, it's MUCH easier to get through the adaptation period of the Infinity X if you have already adapted to the 4 phases of the Infinity Home System. YES, but we highly recommend upgrading to the latest version of the Infinity Home System. It's easy to upgrade an older Infinity Home System to the highest level of protection, without having to pay the full price for the latest model, by simply adding an EarthCalm Synergy Booster. Please note that our latest version of the Synergy Booster was made on September 1, 2018. Whether you choose to purchase a new Infinity Home System, or simply upgrade with a Synergy Booster, adapting to Infinity X will be much easier once you've adapted to your Home System at full strength. How close do I need to be to Infinity X for it to be effective? Proximity is important with this product. 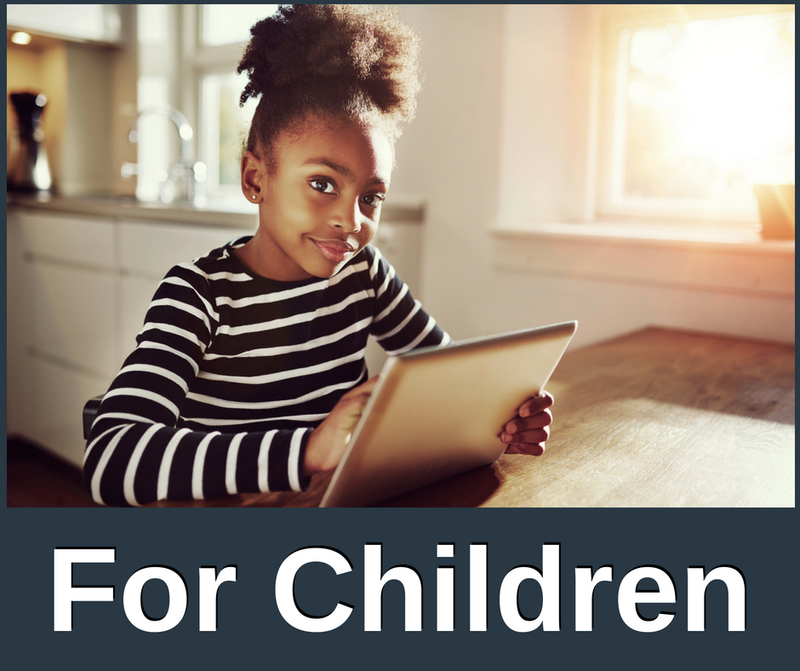 We recommend plugging it in near where you spend a lot of time sitting or where you sleep. It's more effective the closer you are to where it's plugged in, and its strength can be somewhat diminished by walls of your home. Having one in each room is highly recommended. Wearing an EarthCalm Sanctuary Band or an EarthCalm Sanctuary Pendant is still important for when you're on the go, and since all EarthCalm products work in synergy with each other to provide layers of protection, we still recommend wearing our bands or pendants 24/7. That said, Infinity X is a stronger protection product, and a much easier option, if you're not comfortable wearing a band or pendant while you sleep. Remember, Infinity X's effectiveness is limited by your proximity to it, so be sure to continue wearing your band or pendant if you're moving in and out of that space. Is Infinity X similar to the old EarthCalm LunarShield? Infinity X is similar to the LunarShield in that it was primarily designed to help with improving sleep, which is one of the most important things your body needs to heal. However, Infinity X's technology is much stronger than that of the LunarShield, and much easier to use! Q: How many square feet does this reach in a room? A: The Infinity X will reach about 20 feet in an open space. Q: How does this work with the home system I have? Why would an add on be necessary? A: The Infinity X can be used with the system you already have, but we highly recommend upgrading to the latest version of the Infinity Home System. It's easy to upgrade an older Infinity Home System to the highest level of protection, without having to pay the full price for the latest model, by simply adding an EARTHCALM SYNERGY BOOSTER. Please note that our latest version of the Synergy Booster was made on September 1, 2018. Whether you choose to purchase a new Infinity Home System, or simply upgrade with a Synergy Booster, adapting to Infinity X will be much easier once you've adapted to your Home System at full strength. Q: Is this meant for the older Infinity Home Systems only? Or is it intended to be used with ANY Infinity Home Systems, even the latest model now shown on your website? A: This is meant to be used with any updated version of the Home System. If you have a previous model Home System, you may want to consider adding a Synergy Booster to update your older system to the strongest technology we have available now. It is MUCH easier to get through the adaptation period of the Infinity X if you have already adapted to the 4 phases of the Infinity Home System. Q: Can this be plugged into a surge protector or does it need to go straight into the outlet. Same question for the Infinity system? 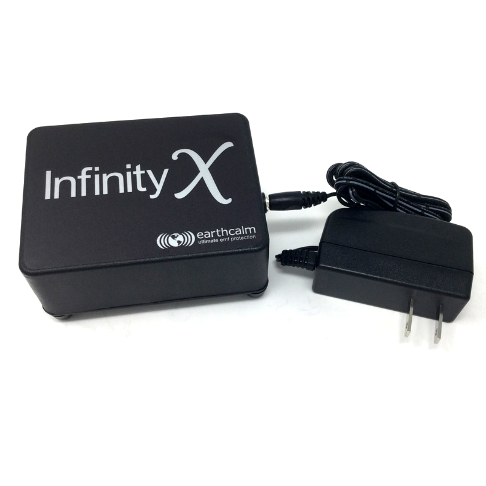 A: Both the Infinity X and the Infinity Home System need to be plugged directly into a live outlet in your home. Before beginning to use the Infinity X, we highly recommend complete adaptation to all 4 Phases of your Infinity Home System. If you are electrosensitive, there is a chance that you will need to further adapt to the strength of the Infinity X. Learn about PRODUCT ADAPTATION. 3. Take some time to gauge the reactions of everyone in your home, including pets. If anyone becomes uncomfortable, unplug the Infinity X and begin plugging it in in short intervals of time, gradually increasing from a few minutes to a few hours. Continue this process until everyone is fully adapted. Remember, you have a 90-Day Money Back Guarantee, so there is no need to rush through the adaptation period. 4. Once you have fully adapted to the Infinity X, keep it plugged in. As a courtesy, tell your houseguests about the Infinity X so they can let you know if they begin to experience any electromagnetic detox symptoms. If the detox becomes too uncomfortable for them, unplug the Infinity X and repeat steps 2-3, so they can adapt to the technology, too. Please Note: Always handle with care. Never expose to liquid and do not allow dust to build up. Wipe clean with dry cloth.